The revolutionary hyper supercar joint development by Aston Martin and Red Bull Advanced Technologies. Formerly it has been identified model by its codename AM-RB 001 and now been officially named the Aston Martin Valkyrie. The name continues a fine tradition of Aston Martin ‘V’ cars, which returns to the 1951 Vantage, which was selected name to distinguish high performance variants in the current model range, as the DB2. Boasting 125bhp versus 105bhp for the standard engine, the Vantage represented a significant increase in performance and desirability. The first time the Vantage badge appeared was on the side of the DB5. It remained a name reserved for the most potent model derivatives until 2005, when the Vantage became a model line in its own right. Twelve years later the acclaimed family of V8 and V12-powered models has made the Vantage the most successful model in Aston Martin’s history. Virage, Vanquish and the Aston Martin Vulcan - Aston Martin’s very own God of fire - are more recent ‘V’ cars to continue this lineage. Now, seven decades after the Vantage name started it all, the Aston Martin Valkyrie propels this uniquely distinctive and lyrical family of model names to another level. For Aston Martin’s Chief Creative Officer, Marek Reichman, Valkyrie perfectly captures the drama of what is not only the ultimate Aston Martin, but the ultimate expression of hypercar design, engineering and performance: “Aston Martin model names have deep meaning. They need to inspire and excite. To tell a story and enrich a narrative that stretches back some 104-years. The Aston Martin Valkyrie is an incredibly special car that demands an equally remarkable name; an uncompromising car that leaves nothing in reserve. The connotations of power and honour, of being chosen by the Gods are so evocative, and so pertinent to a car that only a fortunate few will ever experience.” While its name is rooted in ancient mythology, the Aston Martin Valkyrie is a pure expression of modern technology. 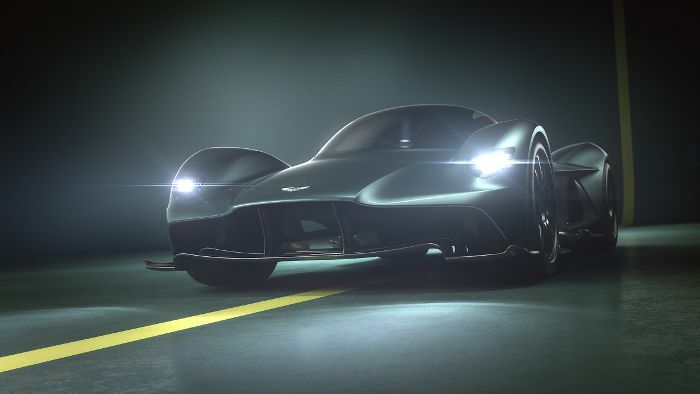 By bringing together Aston Martin, Red Bull Advanced Technologies, project partner AF Racing and some of the world’s leading technology partners, the Aston Martin Valkyrie promises otherworldly performance befitting of its name.